With these words, Rheta Fanizza, Executive Vice-President, Residential and Community Services at Toronto’s Baycrest Health Sciences, kicked off a timely panel discussion at Innovative Solutions to Hallway Health Care, a policy event at Queen’s Park on Oct. 30 presented by Ontario’s Universities. 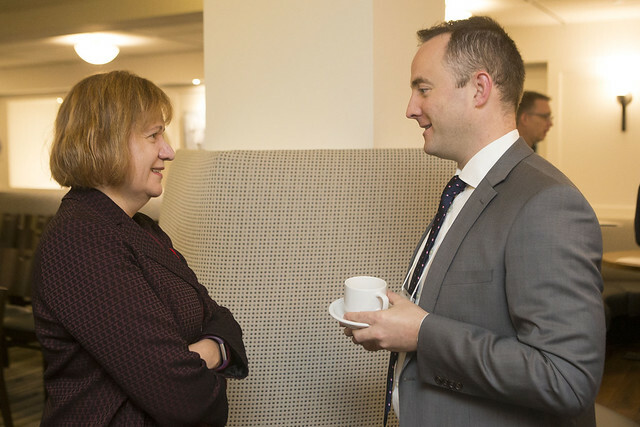 The event was the first in a Policy Discussion Series in which Ontario universities are bringing together government, policymakers and stakeholders for solutions-driven discussions to tackle the province’s most pressing issues. Christine Elliott, Minister of Health and Long-Term Care, was joined by MPPs, health-care stakeholders, university researchers and members of the Premier’s Council on Improving Health Care, including its chair Rueben Devlin, to hear the expert panel discuss solutions to the stresses in the province’s health-care system. Panel moderator Fanizza brought the scale of the hallway health care problem sharply into focus. In 2015-16, she said, 3,900 Ontario hospital beds were occupied by people who should have been receiving care elsewhere in the system – that’s enough to fill 10 hospitals. In addition, she said, 33,000 people were on a wait list for long-term care. And given that one in four Ontarians will be over 65 by 2041, the challenge to the province’s health-care system is only growing. Panellist Dr. Michael McGillion, Associate Professor and Assistant Dean of Research at McMaster University’s School of Nursing, talked about innovative technologies that can help the system meet the challenge. For example, one problem McMaster is working to solve is the high rate of post-surgical readmissions. McGillion said nearly one in five cardiac and major vascular surgery patients end up back in hospital within 60 days because of issues such as post-operative pain or heart arrhythmia. In partnership with Philips, McMaster researchers have deployed the company’s Guardian technology to monitor the vital signs of post-operative patients on the ward in real time, 24 hours a day. Replacing the traditional, time-consuming system of manual checks by nurses, the system’s sensors now spot any deterioration in patients and immediately warn staff. And when patients over 65 are ready to go home, researchers equip them and their family with a tablet and Bluetooth-based monitoring system to send data such as blood pressure and oxygen saturation back three times a day to the hospital, improving outcomes and cutting back on readmissions. Fanizza said there were positive signs in the emergence of policies supporting older people to age in the community rather than hospital, aided by innovative technologies and new approaches to care. Deborah Simon, co-panellist and CEO of the Ontario Community Support Association, said the smartphone is becoming ”the tool of the future”, as mobile apps begin enabling care givers to remotely monitor patients and connect with nurses and other professionals. Panellists and audience members, including Michael Decter, CEO of LDIC investment firm and a member of the Premier’s Council on Improving Health Care, raised the issue of using technology to better manage the often poor transitions between hospital care and home or community care. Dr. Davy Cheng, Acting Dean of the Schulich School of Medicine and Dentistry at Western University, said health-care professionals are good at what they do, but unless policymakers address the full “circle of care,” looking at how the system works as a whole, the hallway health care issue will not be fixed. The panel also said the many young companies that are producing innovative health technologies need help to scale up and get their solutions into hospitals. Fanizza said these firms are encountering too much red tape in terms of regulatory testing and approvals, while McGillion added that they are often denied access to research funding that would help them get their technology to market. Examples of creative technological solutions to hallway health care were dotted around the event. Eight research projects from Ontario universities demonstrated their cutting–edge technology, including a robotic arm from University of Toronto that helps stroke survivors regain motor function; a partnership between the University of Waterloo and the ecobee company that uses thermostats and sensors to monitor patients at home; and a mobile platform commercialized out of Trent University that makes ordering of home-care equipment more efficient and cost-effective. Read this report for more in-depth examples of how universities are leveraging talent and technology to partner for a better future for health care in Ontario.